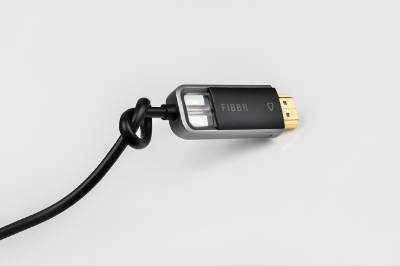 At CES 2018, FIBBR unveils Ultra 8K, an ISF-certified fiber optic HDMI cable, claiming 56Gbps bandwidth up to 50 meters. Joe Zhang, product manager for FIBBR, shows off the company's HDMI, DVI and DisplayPort cables at CES 2018. The Ultra 8K HDMI cable is certified to 18Gbps by the Imaging Science Foundation. CES 2018 marked the first time many manufacturers were able to showcase products designed to meet the new HDMI 2.1 specification. 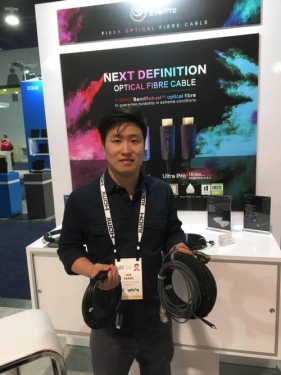 And that was the case for FIBBR, made by EverPro Technologies Co., which revealed its Ultra 8K fiber optic HDMI cable, which the company claims to be the world’s first 56Gbps 8K-HDR Fiber Optic HDMI cable. The company says the cable is capable of transmitting HDR data in residential applications up to 50 meters. The Ultra 8K is made with high-quality glass fibers, available exclusively from YOFC, the world’s largest fiber producer. FIBBR’s BendRobust technology allows the fiber to be bent 180-degrees, and assures flexibility and durability in extreme conditions with uninterrupted transmission of signals, according to the company. FIBBR's BendRobust technology enables its fiber optic cables to bend 180 degrees. The company's fiber optic cables are slim and flexible, yet strong and extremely lightweight—60 percent lighter than traditional cabling. 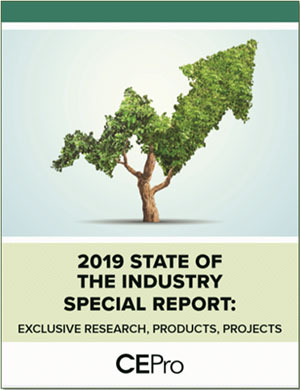 These key advantages are critical in protecting valuable connected hardware devices from potential harm caused by heavy cables putting undue stress on delicate connectors. FIBBR’s proprietary technology delivers the power direct from AC coupling, eliminating the need for external power on the receiving end while achieving simple plug and play. To enable a trouble-free installation, FIBBR uses a SmartLED indicator visible on the source connector—a blue light confirms proper connection and operation status, while no light indicates an improper connection. Other features of the fiber optic HDMI cables are reliably high bandwidth, low signal attenuation, and high resistance to external electromagnetic interference—all necessary features for future, higher-definition developments.